The new colorimetry-corrected ColorDx tests include both the military-grade PIP 24 "Standard" and "Pediatric" Color Vision Testing Made Easy series. New ColorDx® tests in print are now available with value added features. Using the latest colorimetry-corrected printing methods, the ColorDx Standard 24, is the newest edition of Dr. Terrace Waggoner’s naval-validated print version of the 6-confusion color test for color vision deficiencies (the “PIP 24”). The Standard 24 features the military validated adult / literate test, new administration features, enhanced reporting, a market-proven illiterate / pediatric test section, plus the addition of the novel “Blind Spot Amsler™” pioneered by Dr. Waggoner. Konan’s ColorDx® products are family of proven tests for assessment of color vision deficiencies, sometime called colorblindness. Tests are available for genetic and acquired deficiencies, adult / literate and pediatric / illiterate, and in multiple formats: print and as applications on Windows, Android, Mac, and soon on Apple’s iPad®. Additionally ColorDx is available on Chart2020®, the premier visual acuity and ocular performance testing platform as a guided, self-scoring Wizard. ColorDx includes military-grade color vision testing that is routinely used at NAMI (Naval Aerospace Medical Institute) for qualification of Naval aviators, and specified for use by the FAA for qualification of civil aviation pilots. The electronic version is self-administering, self-scoring, and self-reporting. ColorDx is FDA listed and CE marked, and is used world-wide in academic, research, and clinical eye care practices. ColorDx color vision tests are developed by Terrace Waggoner, OD and were recently featured in the Wall Street Journal article New Outlook on Color Blindness. 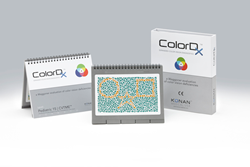 ColorDx is now available from Konan Medical, Konan territory managers and distributors globally. The Blind Spot Amsler test is featured by the Macular Degeneration Foundation’s web site. Macular Degeneration is the leading cause of vision loss in Americans over age 60. Headquartered in Irvine, California, Konan Medical USA Inc. develops, manufactures, sells, distributes and services specialty diagnostic products for eye care clinicians and eye banks, and supplies clinical diagnostic products for many of the leading ophthalmic product companies in support of sponsored FDA clinical trials research in the United States and other parts of the world. Konan Medical USA, Inc. is an ISO certified company. For more information on ColorDx and Konan, visit http://www.KonanMedical.com.